A steady trickle of new walker and rollator models has entered the market, but the Medline Ultralight Freedom rollator is still our pick as the best top mobility aid. Drive Medical still sweeps the rest of our top picks, with some solid competition from Nova. Specs that Matter Outside width: 24" Inside width: 17" Weight limit: 250 lbs. Users love the Medline UltraLight Freedom's combination of lightweight build and narrow construction. It only weighs 11 pounds, but still feels sturdy and stable as long as you fall under its maximum weight limit of 250 pounds. The 6-inch wheels handle indoor and outdoor obstacles easily, and the removable storage pouch with a shoulder strap is a favorite feature. This walker adjusts to accommodate a wide range of user heights, from 4 feet 11 inches to 6 feet 4 inches. Specs that Matter Outside width: 30.5" Inside width: 22" Weight limit: 500 lbs. For those who want a little extra space or weight capacity in their rolling walker, the Drive Medical 10215 Go-Lite rollator measures 22 inches between the handlebars. Its sturdy steel frame supports up to 500 pounds, and the oversize seat comes with extra padding. The 8-inch wheels handle any obstacle easily, and the backrest comes off without tools if you want a little extra space. This walker adjusts to accommodate users between 5 feet 8 inches and 6 feet 6 inches tall. Specs that Matter Outside width: 23.5" Inside width: 16.75" Weight limit: 300 lbs. If you're on a budget, the Drive Medical 10257 offers a great build and features at an affordable price. Its 7.5-inch wheels make short work of obstacles, and the 23.5-inch frame fits easily through most interior doorways. This rollator's steel frame -- a great find at this price -- supports up to 300 pounds. It adjusts to fit most users between 5 and 6 feet tall, and comes with a removable storage basket that fits under the padded seat. Specs that Matter Outside width: 24" Inside width: 17" Weight limit: 350 lbs. 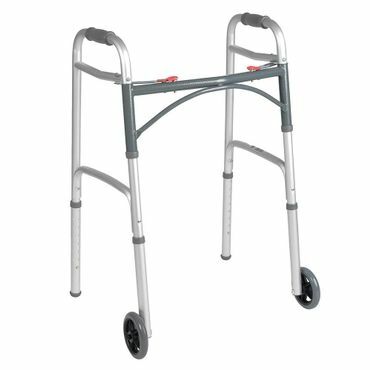 The Drive Medical 10210-1 folding frame walker is lightweight -- just 7.5 pounds -- and narrow enough to fit through most interior doorways, with a two-button folding mechanism that lets you fold either side independently for particularly tight squeezes. This sturdy walker supports users up to 350 pounds, and the handle can be adjusted from 32 inches to 39 inches, high enough for users over 6 feet tall; there is a junior version for people close to or shorter than 5 feet. Walkers can restore some measure of mobility to those who struggle to get around due to injury, illness or age. Rolling walkers -- often called rollators -- are by far the most comfortable type of walkers for those who have enough balance to use them. Built-in seats make it easy to stop and rest on long walks, and removable storage pouches or baskets make it easy to shop independently, too. All the rollators in this report have bicycle-style brakes built into the handgrips, plus brake locks that lock the walker in place when you use it as a seat. They also fold flat for transport for storage, but don't lock in that position; some users add a strap around their walker's legs to keep it from flopping open as they load it into the trunk of their car. Although walkers seem like pretty straightforward pieces of equipment, in fact, you can be injured by improper use. The Food and Drug Administration used to maintain an adverse events database that contained reports of falls or breakage from walkers and rollators. Although this information is no longer available online, it reinforced just how important it is to observe the maximum weight limits for any walker or rollator model. Many of the adverse events reported in the FDA database may have been avoided by observing the walker weight limits or doing proper maintenance on rollators. 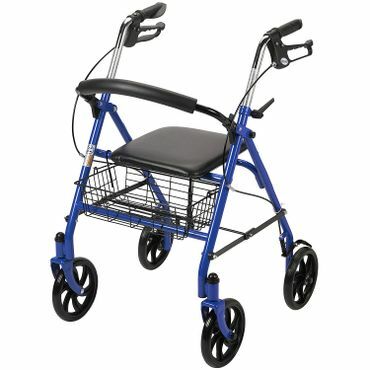 Our top choice in a rolling walker remains the Medline UltraLight Freedom (Est. $85) rollator, sometimes sold simply as an "UltraLight Rollator." This lightweight aluminum walker only weighs 11 pounds and is narrow enough to fit through most bathroom doors (usually the narrowest spot in the house). Users say that despite its light weight, the Medline UltraLight Freedom feels sturdy and well-made. However, if you're close to its 250-pound upper weight limit, this is probably not the rollator for you; keep reading for sturdier models that are designed with a higher weight limit. The Medline UltraLight Freedom rollator's 6-inch wheels are big enough to move easily over all sorts of obstacles, including gravel, stone walks and grass. Users also like its padded seat and backrest, and the removable, water-resistant under-seat pouch. Said pouch comes with a shoulder strap for easy carrying, although we do see some indications that the latest version of that pouch is a little harder to get on and off the walker than previous models. You do need to assemble the Ultralight Freedom rollator, but you won't need any special tools and the most difficult part -- the brakes -- comes already assembled. This walker folds up for easy transport in the trunk of your car, but several users note that keeping it folded as you lift it in and out can be tricky -- a common quirk of all rollators we've evaluated. The UltraLight Freedom adjusts to fit users between 4 feet 11 inches and 6 feet 4 inches tall; short users are especially thrilled with how well it fits them. However, you should be able to fit between the walker's handles (which are only 17 inches apart) in order to use it. If you need more space or a higher weight limit, consider the Drive Medical 10215 Go-Lite (Est. $115) oversize rollator, which measures 22 inches between the handlebars. 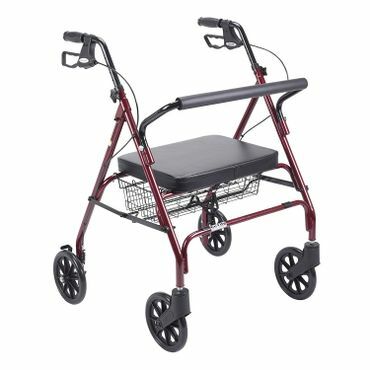 This walker has 8-inch wheels, a sturdy steel frame that supports up to 500 pounds and an oversize seat with extra padding. 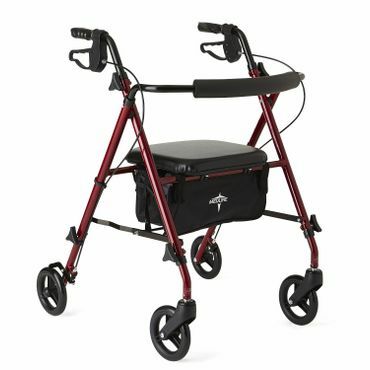 The downside to this sort of rollator is that, at 30.5 inches wide, it won't fit through many interior doorways, although if you live in an ADA wheelchair-accessible facility or house, it'll fit through those doorways very easily. That extra width also makes the Drive 10215 Go-Lite rollator more comfortable for larger users, and the padded backrest comes off without tools if you want a little more space. It also has a detachable under-seat basket for additional storage, and adjusts to fit users between 5 feet 8 inches and 6 feet 6 inches in height. The walker itself weighs 26 pounds, and users warn that it can be a challenge to get into the trunk of a small car. Another excellent heavy duty rollator with 8-inch wheels is the Nova 4215 Mack Heavy Duty (Est. $235), which supports up to 500 pounds, measures 20.5 inches between the handlebars, and adjusts to fit users between 5 feet 5 inches and 6 feet 2 inches in height. It also comes with a removable storage basket and padded seat and, at 24.5 inches wide, the Nova 4215 Mack is narrow enough to fit through many -- though not all -- interior doors. Users like that the padded backrest on this walker swings out of the way for storage or transport, and they say that the new hard plastic wheels last a lot longer than the gray rubber wheels on previous models. The Mack Heavy Duty is part of a popular line that also includes the Nova 4214 Mini Mack (Est. $230) and the Nova Mighty Mack 4216 (Est. $350), which are designed for users from 4 feet 1 inches to 5 feet 5 inches and 5 feet 5 inches to 6 feet tall, respectively. The Mighty Mack also supports up to 600 pounds but is 27 inches wide, so it won't fit through all interior doorways. In our previous update, we had our eye on the steel Medline Heavy Duty Bariatric Rollator (Est. $200), a new entry in the bariatric category that weighs 25 pounds and supports users up to 500 pounds. It also comes in a 19-pound Aluminum Version (Est. $150), which has a weight limit of 400 pounds. Both rolling walkers measure 23.5 inches wide between the handles and adjust between 31.5 and 37.5 inches high, which makes them appropriate for most users between 5 and 6 feet tall. After tracking these models for a year, we can say that most users like them for the same reasons they'd like any bariatric model: The 8-inch wheels can roll over almost anything, and the walker itself is sturdy and roomy enough for larger users, while smaller users enjoy the stability and having enough space to add extras like cup holders or simply lounge around in comfort. However, both models suffer from the same issues as other bariatric walkers -- for example, users say the Medline Heavy Duty rolling walker won't fit through all interior doorways and can be a challenge to wrestle in and out of a car trunk, even when folded. A few also wish for grippier rubber wheels instead of smooth plastic. If cost is your primary concern, consider the Drive Medical 10257 (Est. $50) rollator. It has 7.5-inch wheels (which, under industry standards, may sometimes be listed as 8-inch wheels) and its handles adjust between 31 and 37 inches high, making it appropriate for most users between 5 and 6 feet tall. At 23.5 inches wide, the Drive Medical 10257 will fit easily through most interior doorways, and sports an extra storage basket under the padded seat. Users like that this rollator comes already assembled; all you have to do is bolt the brakes into place. It's also made of steel -- a great find in this price range if you don't mind the weight of more than 18 pounds -- and supports up to 300 pounds. If you only need a walker for balance but not for major weight-bearing, you might prefer a three-wheeled walker like the Nova 4900 Traveler (Est. $90). This "trike" walker is very popular with users who are able to "walk with" the rollator instead of walking up to it, then moving it forward for another set of steps. Most three-wheeled walkers draw criticism for not offering much lateral (side-to-side) stability, but users say the Nova 4900 Traveler still feels very stable. This little walker doesn't have a seat, but it does come with lots of storage, including a large basket with a tray topper and a sizable rear pouch. At 25 inches wide it fits through most interior doors, and adjusts to fit users between 5 feet 4 inches and 6 feet 2 inches, up to 250 pounds. The steel frame makes it a fairly heavy 15 pounds. Although it's a popular choice, the Nova 4900 Traveler might have some competition from the Drive Winnie Lite Supreme (Est. $100). Like the Traveler, the Winnie Lite Supreme is highly maneuverable, easy to fold, and easy to transport; it weighs just 11 pounds, and users say it fits easily into the trunk of even a compact car. They also like its sturdy carry pouch, which can be swapped out for an optional wire basket instead. Users report that the Drive Winnie Lite Supreme feels sturdy and reliable up to its 300-pound weight limit but, like all three-wheeled walkers, it has a few limitations. It lacks a seat, and if you take turns too fast or put all your weight on just one of the handles, it'll tip. And finally, although the 7.5-inch tires are great for speedy stability, a few users warn that three-wheeled walkers just don't cut it for going over really rough pavement or grass. But for relatively strong walkers who only need a little bit of balance help, the Drive Winnie Lite Supreme and the Nova 4900 Traveler are great choices that are easy to transport and fit easily through most doorways. Physical therapists often recommend using an old-fashioned folding frame walker instead of a rollator, because frame walkers are slower and won't roll out from under you. This style of walker, which you must lift and move forward with every step, is especially handy if you struggle with posture or are concerned about your ability to safely operate the handbrakes on a rolling walker. Folding frame models are also small, light and affordable, which makes them a great choice if you only need a walker for a short period. Like rollators, the best frame walkers adjust to fit your height, feel stable and sturdy, and are narrow enough to fit through your household's interior doorways. At 24 inches wide with a weight limit of 350 pounds, the Drive Medical 10210-1 (Est. $30) deluxe two-button folding walker delivers those qualities for most users. This aluminum frame walker weighs just 7.5 pounds; users say it's easy to get into a car trunk, and the two-button folding mechanism means you can fold just one side at a time if you need a little help squeezing through any particularly narrow doorways. The Drive Medical 10210-1's handles adjust from 32 inches to 39 inches high, making it suitable for most adults over 5 feet tall, as long as you fall within its weight limit and are able to fit into the 17-inch-wide opening between the handlebars. For shorter users, a junior version is available that adjusts all the way down to 25 inches, low enough to accommodate users well under 4 feet tall. Contoured vinyl handgrips give you some extra security, but users say they may emit some odor when you first unbox this walker. If you need a greater weight capacity or more space inside the walker, the Medline Extra-Wide Two-Button Walker (Est. $80) draws excellent user feedback for its wide, sturdy frame and 500-pound weight limit. The Medline extra-wide bariatric walker measures 22 inches between the handles and adjusts to suit most users between 5 feet, 5 inches and 6 feet, 4 inches in height. It also has optional 5-inch wheels and, depending on who you buy from, said wheels may come already attached to the front end of the walker. Just be warned that while this walker offers plenty of support and interior space for larger users, it's too wide to fit easily through a 30-inch interior doorway. If you only have grip or arm strength on one side of your body, or don't need a full walker but want more support than you'd get from a cane, consider the Drive Medical 10240 Side-Style Hemi Walker (Est. $30). It weighs just 4 pounds and folds down for easy transport. Some customers use the Drive Medical 10240 as a one-sided walker, swinging it along beside them; others keep it handy to use as a support when they get out of the shower, or to help them pull themselves from sitting into standing. It adjusts between 29.5 and 37 inches -- so sub-5-foot users and 6-foot-plus users should both be comfortable with it -- and supports up to 300 pounds. Although most walkers and rollators are designed to fold up for storage or transport, many users complain that the resulting bundles are still too large and unwieldy. One solution is a folding travel walker like the Stander EZ Fold-N-Go (Est. $125), which weighs less than 8 pounds and folds up small enough to store easily in the overhead compartment of an airplane or the floorboard of a car. Users particularly like that it still stands on its own when folded, which makes it easy to tuck out of the way -- but not out of reach -- in public places like restaurants. There are a few trade-offs to having a walker that folds this easily. Although the Stander EZ Fold-N-Go supports up to 400 pounds, it doesn't have a seat. Its two swiveling, 6-inch wheels are great for maneuverability, but users point out that they "seem to go every which way" on rough surfaces. If you have the most recent version of this walker, you can use an Allen wrench to set the wheels to fixed positioning -- but users say this makes the walker harder to navigate. Still, the Stander EZ Fold-N-Go is a favorite with those who are fairly steady on their feet and just need a little agile, highly portable support now and then, especially if they do a lot of traveling or dining out. We also found a couple of user comments that Stander's customer service department is quick to help out in case of problems. At 25.5 inches wide it fits through many interior doorways, although it is only a surprisingly petite 18 inches wide between the handles. Although expert testing of walkers is hard to come by, the Mayo Clinic offers expert advice on how to choose and use the best walker for you. Consumers -- both users and relatives who buy walkers for them -- provide the best available reviews of specific walker models. Amazon and Walmart are the best sources for that user feedback, with some models accumulating hundreds or thousands of user reviews. In terms of quality, some of the best user reviews came from SpinLife.com and 1800Wheelchair.com; often, these reviews come from the walker users themselves. Consult a physical therapist if possible. Not all walkers fit through bathroom doors. Check the fit to your body.